When presidential candidate John McCain selected then-governor of Alaska Sarah Palin as his running mate, hunting moose became more than a Jack London-inspired fantasy. Palin's anecdotes about feeding her family with moose she shot herself made the age-old Alaskan tradition part of the national conversation for a while. But there's more to moose than the value of harvesting their meat. Alces alces inhabit almost all of Canada, most of central and western Alaska, much of New England, the upper Rocky Mountains, and pockets in the midwest. They are the focus of myriad scientific studies, their browsing habits and droppings affect the ecosystem on individual, community and landscape levels (see "Acceleration of vegetation turnover and element cycling by mammalian herbivory in riparian ecosystems"), they provide prey for wolves and bears and feed scores of native people in Alaska (see "The Importance of Moose, Caribou, Deer, and Small Game in the Diets of Alaskans"). About 29,000 hunters kill roughly 7,300 moose in Alaska annually, and each individual yields about 256 kilograms (that's about 563 pounds) of edible meat. Moose are also simply beautiful to watch, as Polar Field Services' Alaska Operations Manager Stan Wisneski knows first-hand. Stan sent us some shots he took at Grayling Lake, Alaska. 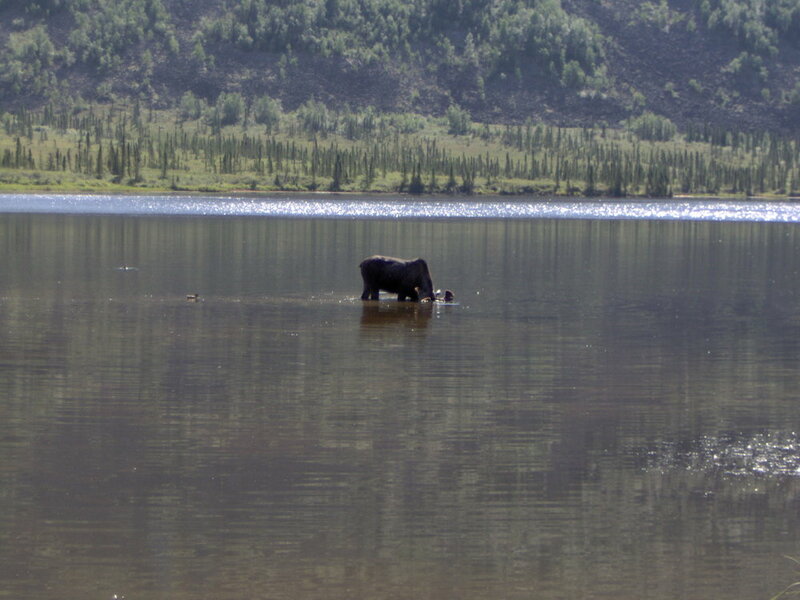 Moose taking a dip in Grayling Lake.